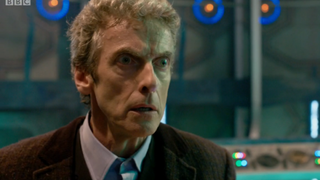 Can the Doctor Afford to Be Unlikable? Apparently the ratings for Season 9 of Doctor Who leave something to be desired. This bodes poorly, but it’s not the first time a prickly Doctor divisible by 6 has seen a dip in ratings. So it begs the question: Can the Doctor afford to be unlikable? I try and fail to be objective: I happen to quite enjoy the crotchety, cranky, old misanthrope of a Doctor because I’m a crotchety, cranky, old misanthrope. We’d get along famously. BUT. Capaldi’s Doctor arrived after not one but two extremely popular Doctors. It’s like following up a gorgeous supper with an obscure, bitter dessert that “grows on you”. In any case: his personality is a hard pill to swallow, and the ratings reflect that. But is that fair? The First Doctor had to be softened up to widen his appeal. Six was on his way to mellowing out when Colin Baker was fired. Numbers don’t lie, and viewers clearly prefer a Doctor they can like, as opposed to simply root for. Is there a way to continue exploring this Doctor’s journey without compromising what Moffat and Capaldi are trying to do? If they decided to change course, when and how would they do so?